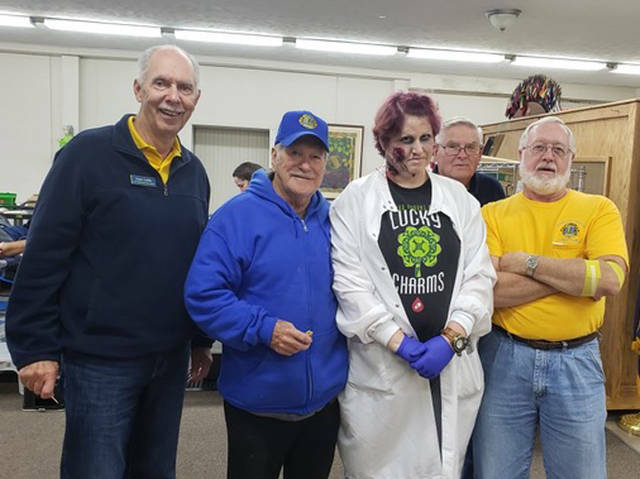 Union City Lions members Owen Griffith, George Green, Francis Hoggatt and Mick Carpenter are pictured with Community Blood Center team leader Amanda, who dressed for Halloween. UNION CITY, Ind. – Every eight weeks the Union City Lions hold a blood drive in connection with the Community Blood Center of Dayton. The blood drive held on Monday was very successful in that 30 pints of blood were collected from 33 donors. The Lions Club provides the blood bank with an area for collection, refreshments for the donors and registration for future drives. Karen Carpenter provided cookies for the donors. The Union City Lions has been involved for many years and has helped save hundreds of lives through its efforts.